by Dr Margaret Smith, Research Assistant. 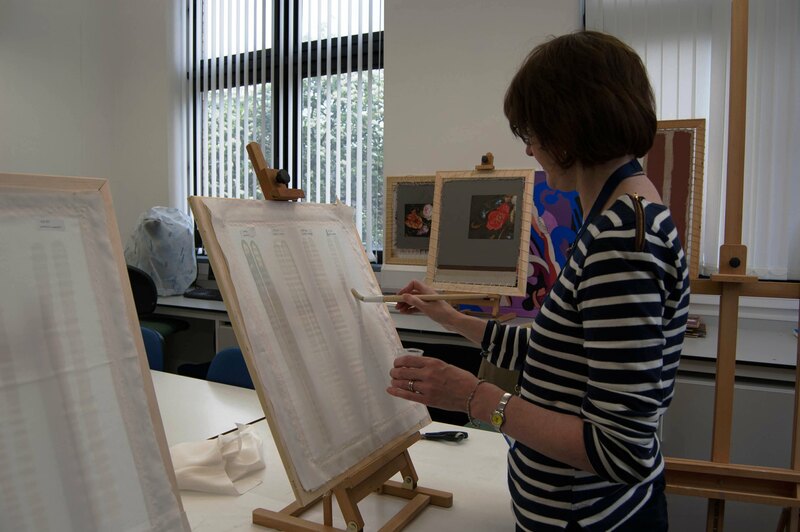 The Centre for Textile Conservation and Technical Art History (CTCTAH) has worked on the understanding of the construction and conservation of painted banners for many years and is currently active in their study. At the moment I am working on a short project entitled ‘Research on Model Painted Textiles’ funded by the Textile Conservation Foundation, with my colleagues Karen Thompson, Frances Lennard and Erma Hermens. The project has been investigating methods of fabricating reconstructions of painted banners to help us make accurate and useful replicas. These could be used in future ageing tests and also to test the usefulness of analytical instrumentation. Gaining this understanding of the complex surface and interfacial interactions occurring in these historic objects over time is essential to develop conservation practice. 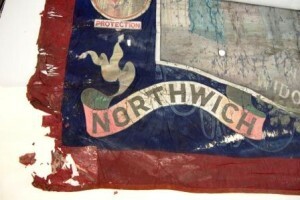 We can see typical degradation such as substrate splitting, peeling and paint cracking in a National Union of Railwaymen banner from around 1880. The CTC has banners in its collection and this has enabled us to sample from these and help develop analytical protocols as well as building up data on the materials used in painted banners. The pilot reconstructions have been based on the knowledge that banner makers used rubber and animal glues in their preparatory layers. There is information in the literature describing processes of preparing canvases using rubber preparatory layers, sold by artists’ suppliers in England and France in 19th century. Painted banners are un-tensioned and designed to be flexible and to drape, unlike a painting on a tensioned canvas. It is common for the paint to be applied to only part of the surface and this has implications for its appearance, function, degradation and also for its conservation as the painted and non-painted areas comprise two distinctly different surfaces. Banners are painted on both sides therefore the textile support is sandwiched between the painted layers. 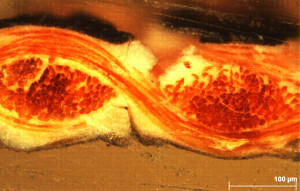 This can be seen clearly when viewed in cross section as shown here. The support used in painted textiles plays a very significant role in how they degrade and are subsequently conserved. 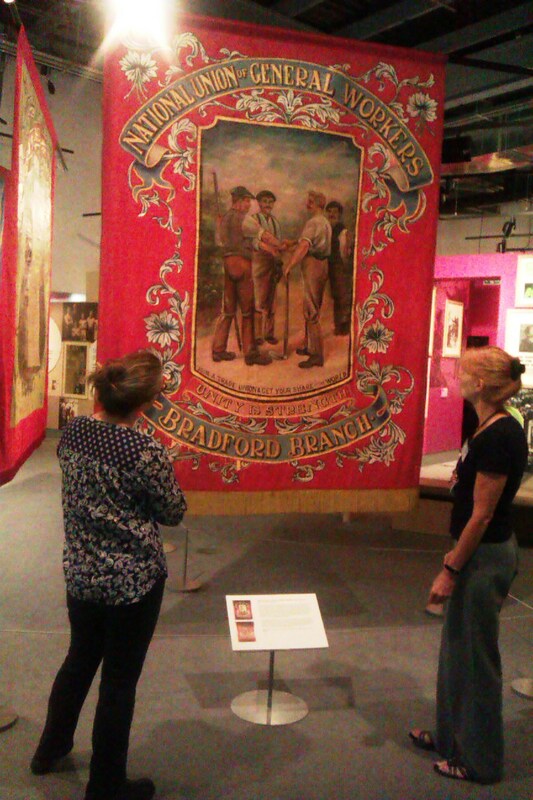 Early banners were often homemade or painted by sign writers, coach painters or decorators. During the nineteenth century, when their popularity greatly increased and organisations such as trade unions had funds to commission professionally made banners, many were made by commercial banner makers. Companies such as Tutill and Toye, Kenning & Spencer and the lesser known Henry Waite were names synonymous with banner manufacture from the nineteenth century onwards. Many people will be familiar with the iconic images of nineteenth and twentieth century banners billowing in the wind as they are paraded in the streets. A wide range of pigments, binders, preparation layers and textiles were used but very little research has been carried out to help us understand more about their construction, methods of production and degradation. This will inform conservation treatments, so there are many questions to answer! We need a multidisciplinary approach to answer these questions and so we are seeking further funding that will enable research to be carried out by textile conservators, materials scientists and social historians.